1305661656 -Reflecting ongoing research into students’ workflows and preferences, CFIN5 from 4LTR Press combines an easy-reference, paperback textbook with Chapter Review Cards and an innovative online experience–all at an affordable price. The result is a solution that engages students of all generations and learning styles. With CFIN Online, students can explore CFIN5 anywhere, anytime, and on most devices! Innovative StudyBits™ feature intuitive functionality that enables students to easily create notes from interactive content as they go through the text–helping them study more effectively as well as visually monitor their own progress. New Chapter Highlight boxes relate chapter concepts to everyday life and news taken from current headlines. 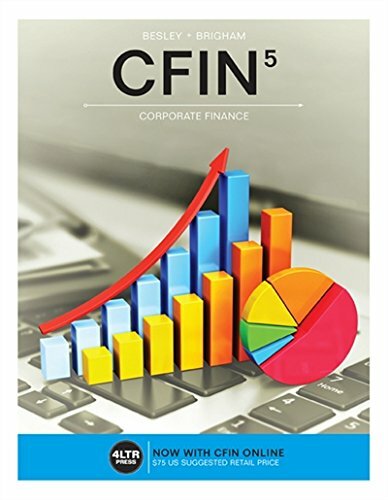 With its straightforward course management, assessment, and analytics for instructors, CFIN5 with CFIN Online integrates seamlessly into your Corporate Finance course and maximizes success for students and instructors alike.